So you want to learn how they do those pretty slick WordPress search forms. The ones that have drop downs of categories, filtering through your posts as soon as you press submit. These are most often used in advanced themes such as eCommerce, job posting and real estate themes. These search forms are a real nice addition to your site – making it more usable and user friendly. I’m going to assume that you are pretty well versed in WordPress theme development. I’m also going to assume that you know what custom post types are, and know how to create them. I’m also assuming that you know what taxonomies are. These two things are crucial to our form. Without them, we don’t have much to work with. So ready to get started? Let’s roll up our sleeves and begin. As I’ve mentioned, we are working with custom post types and taxonomies. 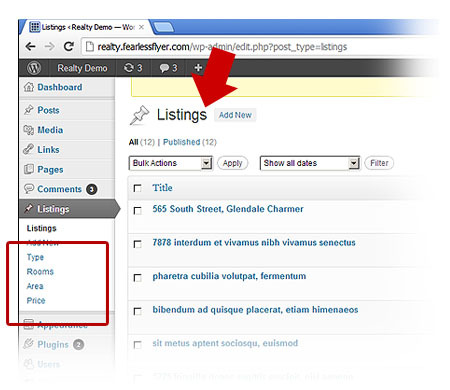 For this tutorial, we are working with a post type named “Listings”. 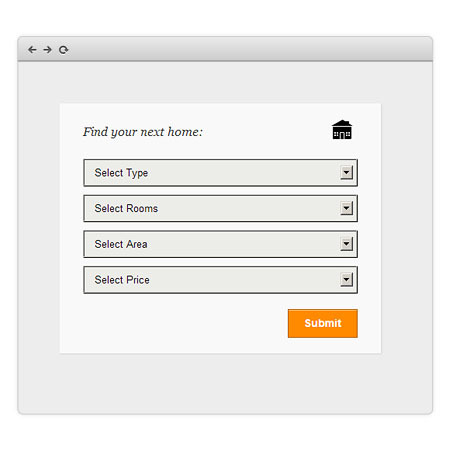 We have also attached several taxonomies to this post type – named: “Type“, “Rooms“, “Area” and “Price“. As you can imagine, a Real Estate website will have visitors who wish to search through your listings that match only the ones that are “Single Family“, “3 Bedrooms“, in “Chicago, IL” and “under $100,000“. So you see how this can be real handy. The above function will run get_terms() on the Taxonomy passed, and will return several option tags with the term slug and name in it. So in your template (where you want your form to appear), create a form and use the function we just created. Test your form and see your drop down lists populate with the right Taxonomy terms. If not, make sure you’ve added the right terms for each Taxonomy in your blog. Also note the form action “/listing-search-results/“. This is a page we have yet to build – one that will handle the form processing. We will cover that in the next section. The code above creates two empty arrays. $item is filled up with each $_POST key and value, and added to the $list array. $cleanArray is a merge with “relation” key with value “AND” to our existing $list array. The above code sets up a few more variables. These are the needed arguments we need to pass into the WP_Query object – which does all the querying. 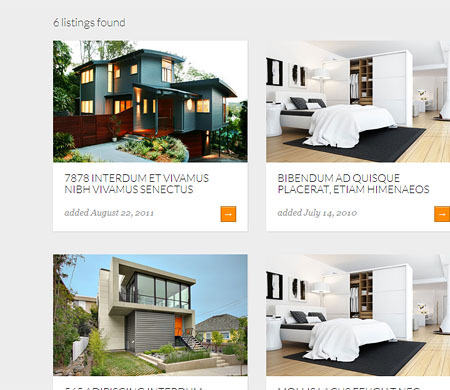 As you see, we’re querying post_type “listings” and returning only 9 items. “paged” is needed for pagination to work, and the main argument “tax_query” – tells the object to query taxonomies. Also note that inside WP_Query is plenty of data sanitation – so data is clean once passed. The code above behaves like a normal WordPress loop. So insert regular template tags inside the “while” loop and your output should render. Notice the use of post navigation (next_posts_link) in the bottom of the code? It should behave like normal posts pagination in WordPress. Our results page with formatting etc. There you have it. An advanced search form that will filter through your custom post types. You can display this search form in any part of your website – ideally in your sidebar or header area. I especially like this treatment because it highlights your custom post type all the more. Making it really stand out from your regular blog posts. Make sure you go through these links to better understand what the code above does. I want to add a date filter in it. Did anyone ever solve the pagination issue? I followed the URL tutorial that people have mentioned and it didn’t work. Whenever I go onto the next page, the array resets and loads all the posts. I am using in custom post type plugin as advance search filters but it can not redirect to search result page which is created in plugin. May be I am using wrong action url. Can you please tell how to use in it? hi, you could resolve this issues? I have three tax select fields. It works fine. Is it possible, when you select one taxonomy, only the available taxonomies in the next select field will show? I don’t have an exact example, but it would be something like, you only display one select. Then as soon as you change it, an ajax call will find out what available tax is under the chosen one. And that’s what you display. It looks like a front end error. Do you have a url I can look at? When I leave with AND, it shows no results because I do not have any posts that match all. If I switch that to OR, it shows posts, but breaks down when there are 2 posts of the same taxonomy, but not the third. Is there a way to adjust this line so that not all taxonomies have to be selected? Found my answer, I realized I am not able to add any additional fields to the form or it will cause problems with the array. This has produced another error in WP with headers already sent that I am trying to work through now. Interesting post about price range slider! but i found that it’s not work with wordpress default post. I am looking for multi step filter. is it possible in WordPress. Like trivia quiz, here it has to display post. i have a problum with search .. first time i saw working ok but after i list more properties the search not work shows We found no results,.. how can i fix it?? Michael, I found this post life-saving, after scouring the web for two days looking for this exact technique. I do have a question, though: is it possible to pass a search keyword to the resulting query? Here is what I mean: take a look at http://www.aerotek.com/. I’m building something similar for a job search site. In the “Job Search” box on their homepage, there are three search fields two dropdowns (custom taxonomies from a custom post type). But there’s also a keyword search field that is hooked to the eventual query when populated. I need to implement something like this in addition to your technique above. Any pointers would be appreciated. Thanks! Awesome tutorial! One quick question though: what is this like in terms of SEO? Since it only has one URL: “listing-search-results/”? If you had to include locations, and looked up something such as “2 bedroom house in London”, how would it show in Google? “/listing-search-result/type/apartment/rooms/3/area/los-angeles”. This would be ideal for SEO. But that means we would have to convert the form method to a “GET” – and format the querystring to: “/key/value” vs “?key=value. Now you can now bookmark and create links with this approach. I would like to do this but am unsure what to do, could you please provide a code example for converting the form method and querystring? you would have to convert the form method to a “get” and grab the values when processing using $_GET in PHP. Wow, great sharing. Do you have an idea where could be found a plugin with both options – filter and search at the same time? I see that this one has the half of the options. Keep up the good job. I tried all the steps you have mentioned but when I click on the search button instead of showing any result it goes to 404 page despite the listing-search-results.php being there and the custom page template properly assigned. Can you help what can be the issue . any plugin that can filter taxonomy dynamically, I have used Meta data and Taxonomies filter but its not working now and I so desperately want to create a search box which goes like Branch>>Semester>>Publication>>Subject, all four are taxonomies , I just need a filter 🙁 how can I do that ?? This tutorial does exactly that – but does require some knowledge of PHP. Thank you very much!!! Such a great tutorial! I am getting “page not found” after clicking on the submit button.please help me where i is my mistake. As i am follow the tutorial instruction. You should create the results page with the template first. Hello can any one help me, I am getting page not found message after clicking submit button. Very helpful tutorial. When i click on submit its show page not found message. can any one help me what is the issue. as i have already created a template with the name of “Custom Search Results”. Please How do I change file names Type, Rooms, Living and Price,? For my language is Portuguese. thanks for this great tutorial. please how can i have one of the taxonomy as text field rather than a dropdown. My tags is for postcode which i want to be a text field. my categories is dropdown which is fine. please how can i achieve this. this search form will only target your custom post type. but others (eg: /page/3/) the cleanArray is empty and all products are displayed but not the search terms. Anyone has a solution for it, why developping such taxonomies relationships without paging working? It would take me too .. is there a way? It’s a good code, but the thing that’s missing is retaining the values of the submitted form, so when a user wants to refine the search they already have their submitted values. if i have 4 select boxs that are rooms, price,days, and time. how do you exclude the time select box. ive been trying figure this thing out for weeks now and i just cant figure this out. its probablly so simple and i cant get it to work. Very helpful tutorial, thanks a lot! I’m experiencing one issue though: all posts (inside the custom post type) are appearing on the search results page. Always. Any ideas what it could be? I followed all the steps exactly how you explained them. 1. inserting the last few $args is probably directly under the $list = $item; – right? 1) – $list = $item is simply adding the $item array inside another array called $list. then we finally merge that with another array called $cleanArray. 2) //add code here is correct. you add the regular template tags there. What helps is to stop the code and do a print_r($array) in every step of the way. This way, you will see if the elements are populating correctly. Hi, I thanks for a great tutorial.. I am relatively new in wordpress and having a problem querying a custom post type.. actually I am a bit confused..
the final dropdown will have the semesters names of that course..
when all of these selected the result will show the list of books that are needed in that course exam..
the example is in this link..
i am very much confused on how to relate them..
From what I understand, you want something like a dynamic drop down list. The values of the next drop down list depends on what is selected from the previous correct? If that’s the case – you will need more that just the tutorial above. The tutorial above is a straight query gather all the post types that have the terms you select. try var_dump($term). see if the object is present. How can show a few taxonomy of a post type instead of all? And how can we add a search field? Really awesome theme. Everything is working well but When I try to get the search result by selecting options from the drop down menu it shows 404 error. Would you please let me know the reason. For not getting a 404 you have to create a page, e.g. called “Listing Search Results” with the permalink /listing-search-results/. This page has to be set to the created the page template, in this case “Custom Search Results”. Thanks Phillipp. Let me rewrite that section. Great that you are keeping it up to date! Please, help in one problem! I have done, as beside You is described above, all were got! But, shall expect such variant. If beside me in the base of the site no such variant, which does my visitor. For instance, he wants to find something that corresponds to all parameter, given in “Type”, “Rooms”, “Area” and “Price”. But I have no such variant, which corresponds to all four parameters. Signifies, I must offer other variants. For instance, “Excuse me, but us have no given on your request, but You may look other variants from “Type” “. Say, please, as possible do the repeated request, for instance “get_posts”? If I have no that, which corresponds to “Type“, “Rooms“, “Area” and “Price“, that how do I offer others from “Type“? Is it possible to show the taxonomy-name instead the taxonomy-slug in the first ‘option’? In other languages we need to show the accents and other characters. Thanks! It would take me too .. is there a way? Please! Did you found an answer ? I’m looking for the same thing. Hi, I know nothing about PhP really, but here’s what I want to do. Any help would be excellent. I want to create a results listings page where one of the taxonomies is pre-selected ie displays a list of say all properties with 3 bedrooms. When you visit it it will display all properties with three bedrooms but also have the search box so users can search for something else. Hi Niall, did you ever get round to completing your goal of creating pages that filter by taxonomy (i.e. 3 bedrooms). If not I don’t mind to help you with that. Thanks. I need to add price range (min – max) selection. How can i do it. abdulawal39, I could kiss you! This was driving me nuts. Thanks! Is there any way to avoid the “Form Resubmission” dialog if a user performs a search, chooses a post and hits the back button? In Firefox there is an error page and I am concerned that users won’t know that they can refresh the page to go back. that happens due to POST. You can avoid this by creating a page in between and use GET instead. Thanks for this great tutorial. Its almost what I need but I need something more… I need a Text field as well as Dropdowns. Please see the attached image to understand more easily what I need. The query will have to change in the processing page. You probably need to search the post_title and the_content for results. Hi, I followed your code example to create a custom search form for my project. I need to have a combination of a text field and a few drop-down boxes like the “Search the Directory” mockup above. The text field that I want to add will search for a relevant custom taxonomy from the same custom post type as the drop-down boxes. Can you please give me an example how to modify the query from the text field to merge those values from the drop-down boxes? Hello please have à solution to add search by name ? please helpe me i like to add name to query. i m not good in programming, can you please tell me how you have created the form and what is Do a print_r() on the $cleanArray and where i have to put it ? Its a very old comment. I got done what I needed but not sure if I still have that code on my server or computer. Send me an email if you need. I’ll try to find the code & send to you. Great tutorial thanks, is it possible to populate the selects with custom fields instead of taxonomies? im sure it’s doable. you just have to research on how to pull them. you’re going to have to filter the id for that taxonomy. so inside the foreach – you have to do an if statement. The above works but If there is a possible better solution like I wrote above will be much appreciated. My filter is not working? Can I also fliter by name? And how do I add a search field? Thanks!! great tutorial and theme! but I want to use checkboxes instead of selector for some taxonomies. Is it possible within your tutorial? Brothr, grt tutorial….I just want to implement your code with a slight change, but when i Use the exact code you used above it is working, But the issue is ‘Paged’ is not working properly. When I use search, First time I am getting Total count of Particular search correctly, but when i click next page link it shows Total Posts count of that Post Type and links ….Can you help me out with this please. Any chance you will add this as a plugin soon? I am not a programmer, but need this search inside custom post types really bad! i wish i had the time to do it soon too. I have a blog “http://financiamento100porcento.blogspot.com” and need an advanced search, as you demonstrate for wordpress. is there any way to do the same for my blog? the slider can be done. the easiest way is to use some type of jscript plugin like jquery ui. you will have to pass the values via ajax. its a bit of front end code. Why don’t you make a plugin for this tipe of search .. will be a succes..There’s nothing as on the wordpress plugins.. Thanks for the explanation, I am going to attempt to do this with checkboxes for each taxonomy term. This worked out great for my needs. I ended up leaving the taxonomies as selects, but modified them to be checkboxes via JS. Thanks for sharing! Created input checkbox with name of taxonomy and term slug as value I wanted to have an array of checkboxes so added ‘’ in the namespaces so php would know about that. Created check variable. Then We need to edit a query a little as htmlspeacialchars works only on string, so we could use only one checkbox at time. We had to remove htmlspecialchars from terms, to have an array there but with that our form is not safe, so we make foreach to add htmlspecialchar for the values. I hope someone may find this usefull, and thanks for the tutorial. The “paged” functionality does not work when you apply filters. For instance, I have 15 total listings. When I apply a filter, I get 10 listings. But I am viewing each listing 1 by 1 – not 10 at a time. I want to click the “Next Post Button” to view the 2nd result…but clicking the “Next Post Button” resets the filter. Therefore, you see the default page that shows all of the results with no filters. Any help? To add to this, the $cleanArray value is reset when going to a new page. I would highly guess that this is the problem. “listing-search-results/page/2/”. What should I do? I want to add the keyword search field (user can type) in your search form. We can do it. Can you give me code for that? i am making a portal for educational resources, and i want to use this theme but instead of listings of property i need a listing of educational resources which can be filtered not by type, rooms and area, but by age subject, interests etc. Also i will need some modification in the single listing template for example i don’t need google maps options etc. as i am no developer, i can not edit yhis theme. can you help me in making such a theme? Hi, thank you for this tutorial. I’d like to use it in my website, but I have to add a search field associated with the filters, can you help me please? I’m wondering the same thing, I want to use a search input field for all my custom post types.. 🙂 Thanks Fearlessflyer! I’m not sure you have that much flexibility w/ blogspot.